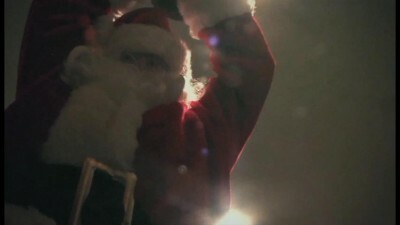 There have been a number of Christmas-themed horror movies over the years, such as 1974's Black Christmas (which was remade in 2006 with some liberties taken) and the quintessential "killer Santa" movie Silent Night, Deadly Night from 1984, which caused such an outrage from the public that it was pulled from theatrical release despite doing respectable box office numbers. Being that Christmas is a traditionally happy and festive holiday, I've perversely enjoyed attempts to show the dark side of it. "Bloody Christmas" follows mostly in the spirit of those before it. A direct-to-DVD production rather than a theatrical movie, and shot on video (but I will largely refer to it here as a "movie" anyways for simplicity's sake), it attempts to present its own "Killer Santa" story with a number of confusing elements. The brief description on the DVD's back cover actually served as a bit of "Cliff Notes" for me in making sense of some of it, which I'll mention as I get to those points. The main character here is Rich (played by John William Young), who spends most of the movie wearing a Santa Claus suit as he has obtained a few gigs playing Santa during the holiday season. The DVD cover mentions that Rich is a "has-been 80s action movie star", although I did not catch any mention of that in the movie. Whatever the case, he's in a pretty lousy mood as it appears to him that everyone around him has forgotten the "true meaning of Christmas" and focused more on commercialism and receiving presents (just a bit of a familiar theme found in other Christmas movies.) He's also pretty down on his luck, as one of his Santa gigs at a department store is abruptly cancelled, as he arrives and is told that he's no longer needed. On top of that, he has car trouble as he's leaving, and upon finally arriving back to his mobile home he finds an eviction notice. In a few scenes, Rich fantasizes about going ballistic and killing those who are making life bad for him- for example, early on he is playing Santa in what the cover says is a local public access TV show, with several kids. He suddenly pulls a gun out and shoots most people in the room, then himself, but it's then revealed to have just been a fantasy sequence as the movie then cuts to everything back to normal. Father Michael (Robert Youngren) is the other prominent character. He's also a bit disillusioned with people. At his church he first gets a visit from a mother consulting him about her abusive alcoholic husband, but is reluctant to follow his advise when he suggests turning him in to the police. He gets really incensed when the girls at his church known as "Sisters" cancel their planned volunteer work for supposedly important reasons, but then runs into them at the mall (while he's there preaching) and sees that they're buying lingerie for a "passion party." Not much real killing happens in this movie, aside from the discovery of a dead body by two guys out hunting. The police, led by Detective Steinman (Robert Arensen), investigate the murder, including a long dialogue scene at a bar. The problem with "Bloody Christmas" is that it is a very amateurish production, about on par with an average student video project. I found most of the acting to be on the level of an elementary school play, with some dialogue laughably bad while other lines delivered so poorly I could barely understand what they were saying (and no subtitles or captions are included to help you out here either). A few scenes were shot with an obviously dirty lens. Many scenes just don't make sense either. For example, the movie opens with a woman committing suicide, but we never even find out her significance to anything else in the movie. Plus, there really isn't much killing or scariness to keep horror fans interested. This is one of those movies that will try the patience of many viewers- while I'm not the type of viewer who will simply stop watching something no matter how bad it is, I have the feeling many others who have watched "Bloody Christmas" have done exactly that. Not to say that it's COMPLETELY without merit. While some of the music score, sounding like it was played on a cheap keyboard, is irritating, other passages were rather good, including a rendition of Edvard Grieg's "In the Hall of the Mountain King" played over a scene where Rich makes a few calls on a pay phone in a desperate attempt to come up with some rent money. (Sure Trent Reznor already did that in The Social Network, but I still liked it.) Rich also spends one scene talking to a local girl about the legend of Krampus, a lesser-known legendary figure who punished the naughty children at Christmas time. This is accompanied by some clay animation lasting just a few seconds. I thought the end credits being introduced as "The Naughty List" was a nice touch as well. Don't let the mention of Troma co-founder Lloyd Kaufman in the cast list on the front cover be your main reason for watching this though. He appears very briefly for a few seconds, as a televangelist asking for money on a TV in one scene. Overall "Bloody Christmas" makes every Troma movie I've seen look like big-budget extravaganzas in comparison. The opening credits state that "Bloody Christmas" was shot on "HD" video, but is only available on standard-definition DVD. The 16x9, 24 frame per second presentation looks cheap overall and appears worse the larger the screen you're watching it on. While re-watching some parts for this review on the computer in a smaller window, the picture appeared much better than on my full 60-inch screen. Audio is in 2-channel Dolby Digital, and quality varies from scene to scene. Some scenes have some loud background hissing, similar to analog tape, which drowns out the dialogue. There is some adequate front-channel separation, but nothing spectacular. The extras on this disc give one a bit of appreciation for the cast. John William Young talking on-set expresses his love for horror movies, and expresses a sentiment I have to agree with: "I'll watch anything- even if it's the worst film, like an Ed Wood film, I find some value in it. Because no matter what you see, somebody put their heart into that." (Unfortunately, he appears a bit thin here as the disc incorrectly flags this segment for 4x3.) There are additional comments from Robert Youngren and Kerri McConnell. They say that they had fun making the movie, which in the end is what really counts. Two deleted scenes are included, both also incorrectly flagged for 4x3 and one with no audio, and three video-based trailers for "Bloody Christmas". Music from the movie, including the synth "In the Hall of the Mountain King" rendition, plays over the extras menus. "Bloody Christmas" is mostly a throwaway production, with very little to please most horror fans. I would suggest that only "Killer Santa" completists bother with it. Jesse Skeen is a life-long obsessive media collector (with an unhealthy preoccupation with obsolete and failed formats) and former theater film projectionist. He enjoys watching movies and strives for presenting them perfectly, but lacks the talent to make his own.